Alcohols are amphiprotic making them both acids and bases. 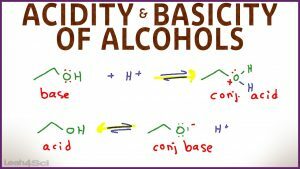 This video shows you how to rank acidity and basicity of alcohols using charge, electronegativity, resonance, and inductive effect with practice examples along the way. This is Video 3 in the Alcohol Reactions Video Series. Click HERE for the entire series.